It’s that time of year again when Meaningful Use conversations heat up because all sorts of deadlines are approaching, and as expected, nobody is ready. Meaningful Use was originally intended to have 3 stages, each lasting two years. At the end of 2011, Meaningful Use Stage 2, which should have started in 2013, was postponed by one year and reduced to 90 days to allow vendors and providers enough time to build, deploy and implement new functionality required for Stage 2. As 2013 is drawing to a close and Stage 2 is practically upon us, a flurry of organizations is petitioning the Secretary of Health and Human Services (HHS) to delay Stage 2 just a little bit longer. The College of Healthcare Information Management Executives (CHIME) fired the first shot back in May, asking for one more 12 months extension. Later in July, the American Medical Association (AMA) and the American Hospital Association (AHA), combined forces and jointly requested additional flexibility to be built into Stage 2 and that providers that are still at Stage 1 should not be forced to upgrade their software in 2014 (more on that below). The American Academy of Family Physicians (AAFP) followed with its own sophisticated proposal on how to better stagger the transition to Stage 2. Next, the Medical Group Management Association (MGMA) petitioned the Secretary to place a moratorium on all penalties for providers that achieved Stage 1, and to allow Stage 1 meaningful users to continue attesting for Stage 1 if they cannot obtain a Stage 2 certified product. HIMSS, the EHR vendors association, sent their letter in support of maintaining the current Stage 2 Meaningful Use launch schedule, but extend its first year to be 18 months long. Confused yet? Let’s detangle the mystery. First and foremost, whether you began your Meaningful Use journey in 2011 or are about to jump in next year, this conundrum affects you directly, because beginning January 1st 2014 all meaningful users must implement and utilize 2014 certified EHR technology (CEHRT). Even if you plan on just attesting to Stage 1 next year, you cannot use just any old 2011 certified EHR. So all 300,000 or so eligible professionals who have previously attested to Meaningful Use Stage 1, plus all late adopters planning to enter the fray in 2014, will be out there trying to wrestle a good place in line for upgrades, training and installations. Most will do so only after January 1st, and all will have to be ready to start clicking the boxes no later than October 1st. That’s over 1,000 clinicians per day, not counting new entrants. Any way you want to look at it, it’s not a very likely scenario. 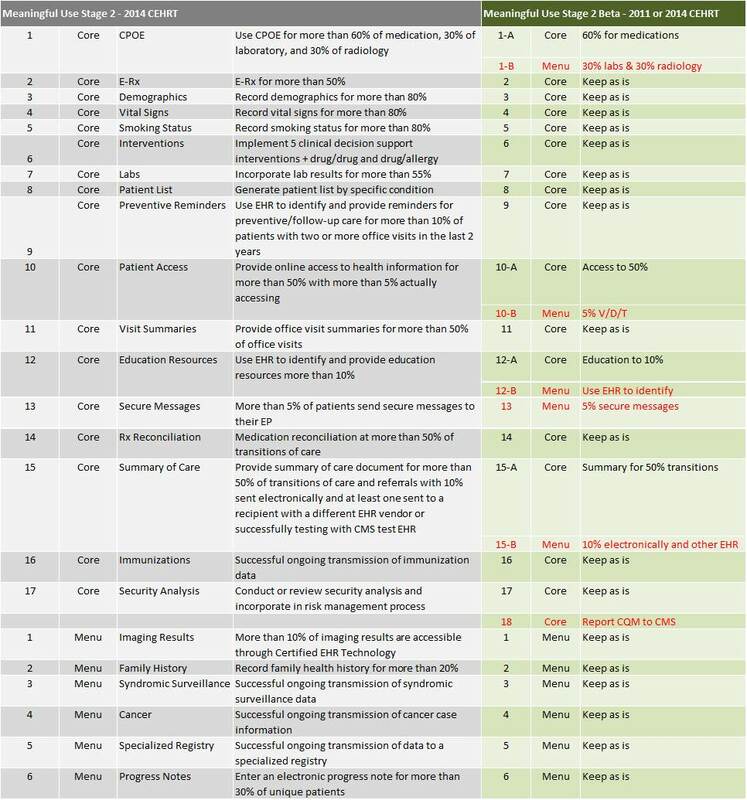 Much has been said in the various letters to HHS regarding the small number of EHRs that managed to get certified for 2014, compared to the seventeen hundred complete EHRs certified for Stage 1. This is true, and this may pose a completely different type of problem down the road when doctors realize that most of these fly by night products will soon disappear. However, as late as October 2010, we had less than three dozen certified complete EHRs for Stage 1, a number that grew exponentially in the following couple of years. My guess would be that by the end of the year all major, midsize and viable minor players will be 2014 certified. The problem this time around is that Meaningful Use Stage 1 has been rather successful and there are now about 6 times as many providers needing a new EHR as there were in 2011, and unlike 2011, those who fail to get their upgrades in time will not only lose an incentive, but will be financially penalized by CMS. It just doesn’t seem fair. There are three factors affecting the Meaningful Use program trajectory: time frame, requirements definition, software readiness. Unfortunately, we started by defining the time frame and then discovered that requirements definition and software certification did not fit in our predefined schedule and not even in our expanded schedule. Also unfortunately, we cannot control software readiness, since it depends on thousands of independent players that we can motivate, cajole or threaten, but that’s about it. What is left then? The requirements. The definition of Stage 2, or any other Stage, is not immutable even at this late junction. Those who made the rules can change them ever so slightly to allow a hybrid Stage 2 Beta (see figure below) to be inserted between good enough and perfection. The changes in #1 and #2 can be all satisfied with 2011 CEHRT. #3 can be satisfied by most 2011 CEHRT, and even some of the #4 measures are already deployed in the better 2011 CEHRT. Splitting and transitioning portions of a handful of #3 and #4 measures from Core to Menu, will allow the 300,000 providers that already attested to Stage 1, to seamlessly move on to Stage 2 Beta without much turmoil. All in all we are talking about 5 such changes from Core to Menu, plus allowing for the increased number of clinical quality measures to continue to be submitted through attestation if necessary. CPOE for labs and radiology capabilities were present in all good EHRs long before ONC certification came into play. Patients access to health information is, by definition, what patient portals are for, and many 2011 CEHRT used portals to become certified. True, ability to download and transmit information is rarely there if at all, but although this is a 2014 certification requirement, it is not a Meaningful Use actual requirement. Having the EHR suggest education materials based on patient health status has been around for a decade, and the better 2011 CEHRT already have that built in. Secure messaging through a patient portal is part and parcel of any patient portal. More exotic forms of messaging which are required for 2014 certification are optional for users (same as #2). 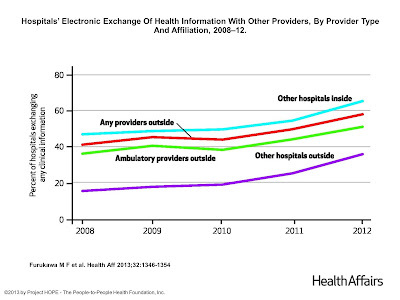 Electronic health information exchange is only available for a minority of users, for reasons other than EHR capabilities, which should have been present in all 2011 CEHRT. Electronic submission of clinical quality measures is possible from 2011 CEHRT that have a CMS approved registry. There aren’t that many and insisting on the methodology here seems a bit petty. The proposed Meaningful Use Stage 2 Beta is achievable with 2011 CEHRT, and allowing it to be used along with the 2014 CEHRT for an interim Stage 2 Beta, should provide immediate resolution to the problem at hand. Since most 2011 CEHRT contain functionality to meet the problematic measures anyway, my guess would be that these newly designated Menu measures will be very popular with Stage 2 Beta attestations, particularly because many of the current Stage 2 Menu measures are heavily dependent on non-existing third party infrastructure. And just so CMS doesn’t feel that it is giving away too much by allowing 2011 CEHRT to be used for a slightly less stringent Core set, let's up the ante on the Menu measures and require that 5 are satisfied instead of the current three. If I was working on Meaningful Use 2 Beta, I would pick the first 4 items above, plus visit notes or family history from the current Menu items (no decent EHR comes without notes and histories). The difficulty with this Meaningful Use Stage 2 Beta proposal is that all downgraded measures have something to do with the much debated subject of interoperability, thus Stage 2 Beta could be erroneously construed as a retreat from interoperability in general, and so called patient engagement in particular. It may be so, but to a very small degree, since there is no way to pick 5 Menu items without having at least 3 of them relate to interoperability/engagement. Besides, it is usually better to continue moving ahead at a slightly slower pace than it is to come to a dead stop, or alternatively keep going fast and furious over the impeding cliff. Personally, I would use the Beta period to evaluate the program to a greater degree than just how much money was paid out in incentives, and I would take a hard look at the incredible complexity introduced in the EHR certification program, because this too frequent and too invasive granularity is not sustainable, and is the root cause for the difficulties we are experiencing right now. 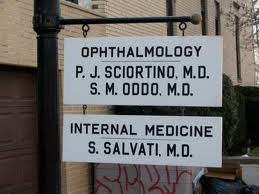 When a doctor, a lawyer, an accountant or any other professional graduated from University, or moved to a new town, he or she would most often locate a nice little office, prepare it for the big day and hang out a shingle to let the world know that new services are available. 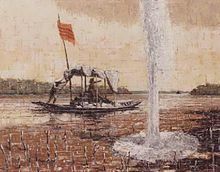 The world back then consisted of the immediate neighborhood in the big city or an entire small town out in the country. While waiting for the new shingle to do its thing, the new doctor would most likely join the country club, attend the pee-wee league games of his/her children, patronize local eating establishments and slowly the word of mouth would help build a new practice that would become a fixture in the community for years to come. Fast forward to 2013 when nobody strolls leisurely where shingles are not hanging any more, and doctors rarely live and raise families within walking distance of their medical practice. Word of mouth has been largely replaced by text of iPhone and the enameled dangling shingles are now flashing electronic signs in the clouds. Heck even doctor services are increasingly delivered electronically from somewhere in the clouds. So when you push open the door to the coffee shop in the morning, chances are that nobody is going to ask you about their gout and nobody is going to say “morning Doc”, and neither you nor they will give a damn anyway. So if you are, or aim to be, practicing independently, you will need to upgrade your shingle for the electronic times. First and foremost you need to hang your shingle where it can be seen by prospective clients. If you have an established practice with a waiting list from here to Armageddon, you can safely close your browser now, and go take care of your patients, at least for the next couple of years. If you are not exactly in this enviable position, read on. You need a shingle on the web, a.k.a. a website. A Google Maps generic listing doesn’t count. A canned webpage with your name, address and hours of operations won’t do either, because the rules have changed. For the skeptical, harried and alienated modern person, your website should provide the same reassurance that a simple white rectangle with the word Doctor on it provided 50 years ago. You need a nice website with a minimum of four or five pages to keep people looking at your shingle a bit longer. As to content, look around for other doctors’ websites, see which ones you like better, and model yours in a similar fashion. A good place to look for structure is hotel websites. Yes, hotels. Hoteliers are trying to convey to customers that they are each very important and special, that they will be safe and comfortable, that the premises are clean and upscale, that staff is dedicated and highly professional, that booking is easy and extra amenities are abundant. If you have a sudden urge to throw up just about now, hire a kid to do this for you. A professional “medical websites” firm is not necessarily better and it will cost you ten times as much. It is pointless to hang your shingle on highway H between endless fields of corn and soybeans (although I know at least one such practice that is thriving). Equally useless would be to hang a shingle from a 5th floor window, or by the back door, next to the big trash containers. Unlike physical shingles, electronic websites can be made to appear just where they are most visible to people most likely to need your services. Today, the equivalent of strolling down Main Street is searching for stuff on the Internet. Having your nice and readable shingle appear in just the right place, at the right time, for the right people, is called search engine optimization (SEO) in the Internet age. Frankly, it is a boring subject, even more so than designing your website, but if you want to read about it, here is a beginner’s guide, and then of course, there is the authoritative book written by Dr. Kevin Pho, which covers much of what we are discussing here. You should peruse these references even if you let one of your kids build the website (kids know all about these things), and even more so if you plan to shell out a few thousand dollars for a professional. Your goal, in a nutshell, is that when someone in your service area is searching for a doctor of your specialty, or a condition that you treat (much more tricky), your website will be the first entry on the first page of Google results. It will take time to get there, but you will never get there if you don’t start. And, yes, this is about marketing, and yes, doctors today are supposed to actively market their practice, just like everybody else. Feel free to pour yourself a drink before reading on. The means by which messages get from one individual to another have obviously changed. Actual “word of mouth” is still a useful communication channel for finding professional services, but most people looking for a doctor will ask Google first, and then proceed to review unsolicited recommendations from perfect strangers. The entire notion of new information being diffused through social networks has been turned on its head, unless you count planet Earth as one social network. You could argue that your practice is local and planet Earth is irrelevant. You could argue that your patients are older, sicker and that they don’t use computers. You could argue that only dumb people would trust anonymous advice on some random website. However, your small universe is now indistinguishable from the whole, and perhaps the patients you have now don’t use computers, but those who influence their decisions most certainly do, and besides we are talking about attracting new patients. As to rating sites, think about your most recent important purchase, and honestly try to remember how much weight you placed on the little yellow stars at Amazon, or their low tech predecessor at Consumer Reports. Not how accurate these turned out to be, but how much they influenced your purchase. Since you are not selling gadgets to the entire world, how can you make those little yellow stars (all 5 of them) appear next to your name? If you search randomly for physicians, you will see that the ones with star ratings have between one and a handful of reviews. This in itself is reason to discard the information as statistically insignificant, but yellow stars are a very powerful visual cue. Let’s get the ball rolling then. Do you have at least one friend/employee that is/was your patient at least once or twice? Is one of your patients a physician also looking for stars? Did you call in a script for Uncle Joe last Christmas? Find your comfort zone and get yourself one 5 star rating. Since there are many places people can rate doctors, pick the one where you have some ratings and link it to your website (e.g. “Dr. Jones on Health Grades”), so people can easily find your ratings and continue to grow them. Some would go as far as suggesting that you should personally solicit that patients recommend you on the Internet. Meh…. What you should do though, is have social media buttons on your website (e.g. like us on Facebook, recommend us on G+). All people have to do is click a button, which most of us are willing to do, and there is no option to “hate us on Facebook”, so risk is minimal. Yes, it sounds humiliating, rather shallow in nature and a mega waste of your time. It is all of the above, except it shouldn’t take any of your time to get with the times (so to speak). For completeness sake, we should mention another type of rating site that may be crucial to building a practice and obtaining referrals. Health plans are increasingly publishing “preferred provider” lists, or add some special designation to the preferred ones on their network listings. These preferences are based on much more complicated and time consuming activities (e.g. MU, P4P, PCMH), and we will address them in a future post. For now be aware that payers “recommendations” are coming and that this is not your grandfather’s word of mouth. This is a warning shot across the bow of the mighty health care ship which seems to be changing course in search of calmer waters to carry the riches stowed deep in its rusty hull. I have no arsenal to fire anything more than sporadic warning shots through the descending darkness, but this ship is now on a collision course with the American people, the 47% that Gov. Romney scoffed at and an equal number that is yet to be awakened by the ringing disaster bells. The navigation chart used by the captains of this ship, mapping an America full of dumb and gullible people, too fat and too lazy to make any sudden movements as the corroding ship sails through their bodies, is woefully incorrect. Americans may be slower than most, more forgiving than others, but sooner or later, the health care ship will have to battle the people, and it will be sank, or emerge victorious at the conclusion of the American experiment. The example provided in the article is of course treatment of mild back pain, which requires no treatment. This, and MRI for headaches, or antibiotics for a cold, are the preferred examples to illustrate the benefits of cost consciousness by both providers and consumers. Nobody dares venture into the conversation that will have to take place with a cancer patient, other than Oregon, of course, which is mandating that this “conversation” takes place before the state will pay for anything. If the “conversation” did not result in the impoverished, sick, depressed and frightened patient asserting his or her “cultural values and preferences” to forgo expensive treatment (as all poor people should), the State will pull the plug anyway, thus empowering those who fail to be empowered on their own. Let’s go back to MRIs and physical therapy for back pain which is a subject better suited for polite conversation. The authors provide us with a very thoughtful script on how a doctor would go about the difficult conversation of gently avoiding overtreatment of back pain. First you find out if the patient has any money in their wallet, then you proceed with the unrelated task of explaining that an MRI is clinically inappropriate. The latter can probably be skipped if the empowered patient doesn’t know enough to ask for an MRI. The next step is to tell the (poor) patient that beneficial treatment, like physical therapy is too expensive for him/her, and suggest self-care at home (an illustrated sheet of exercises should help). To round it up for those with no money and no real insurance, you could amicably suggest the patient’s “local yoga class”. This is how you “[o]ptimize care plans for individual patients”. The optimal care plan for someone living on the 10th floor of a housing project is most definitely a “local yoga class”. Marie Antoinette must be smiling in her headless grave. A couple of years ago, my son’s friend, Kenny, got injured during a football game in his high-school senior year, and needed surgery on his knee. Since Kenny did not have a car, and even if he did he was in no condition to drive after surgery, my son drove him to the downtown clinic for post-op follow-up. Kenny came out of the exam room limping cheerfully since the nurse said that he is all good to go and does not need to come back. My son, having had his own surgical encounter with football’s unintended consequences earlier that year, was a bit surprised and asked where Kenny should go for his physical therapy. According to the friendly nurse, Kenny didn’t need any fancy PT. The boys walked out, one furious and the other limping and smiling sheepishly. I haven’t seen Kenny since that year and I don’t know if he is still limping, but this formerly bubbly and faster-than-the-wind running back has not shown up at the traditional, and immensely popular, Thanksgiving high-school reunion football games ever since. From the dawn of civilization to the current day and most likely well into the future, the rich and powerful in all social orders enjoyed better access to better medicine than members of the human species who are poor and powerless. Similar to disparities in other life-sustaining goods and services, enlightened governance systems have attempted to minimize (not eradicate) these differences in medical service provision due to an emerging sense of social justice and also because prosperity seemed to accrue to better nourished, better educated and healthier societies. A nation founded on the premise that individuals have an inalienable right to pursue happiness cannot weave social injustice into the very fabric of its existence, and expect to thrive. We know this, because we tried similar schemes before, and failed in what were arguably the darkest and most perilous moments in U.S. history. Utilizing inherently trusted individuals to prevail upon the unfortunate that what seems like injustice is actually good for them in the long run, is not a novel idea. Substituting betrayal by physical healers in clinics, for indoctrination by spiritual leaders in churches, is a minor innovation. Internalizing and institutionalizing pure evil wrapped in misleadingly kind and gentle rhetoric, while inflicting much pain and suffering on countless human beings, is also a sure recipe for the ultimate destruction of the perpetrators no matter how righteous they believe they are. Doctors, who are tempted to accept compliance with the newly created Captain positions on the misguided health care ship, without questioning its opiate laden navigation route, are simultaneously terminating the medical profession’s days of glory. There will be no joy. There will be no trust. There will be no prestige. There will be no respect. And there will be no financial privilege. Captains of this doomed ship are a dime a dozen and they all reside below deck. In order to protect privacy, names and locations mentioned in this post have been changed, as have certain physical characteristics, quotations and other descriptive details. At some point it was decided that the exchange of clinical information between facilities of care is lacking in both quantity and quality, and it was further decided that a drastic increase in frequency of such exchange will improve the health of people and the quality of care they received, while reducing costs of health care. The idea, which is almost as old as medicine itself, has been perfected by physicians over centuries of evolving documentation standards and sharing of knowledge in general. As medicine became a service provided by a bewildering array of entities in parallel and/or in sequence over one lifetime, the need for clinical information exchange increased exponentially, making this particular activity a perfect candidate for computerization in the Internet age. Since all computerized functions are better and cheaper than their manual predecessors, it was decided that the Nation must engage in sophisticated exchange of health information to the point where one’s medical records are omnipresent wherever one may need or want to perform, or have performed, a health related function. That’s nice, a bit creepy perhaps, but nice nevertheless, possibly useful, and certainly very convenient. The Department of Health and Human Services (HHS) is the government agency in charge of making Health Information Exchange (HIE) a reality in this country. A recent HHS pamphlet published in Health Affairs provides an update on the state of HIE for the first term of the current administration (2008 to 2012), spanning the first four years of legislation, rulemaking and financial incentives in support of computerizing medical records and their exchange across facilities of care. The results are based on a survey of hospitals that were asked if they “electronically exchange/share” any one of four types of clinical information (clinical summaries, medication lists, lab results, radiology reports) with other hospitals or ambulatory providers inside or outside their own system. 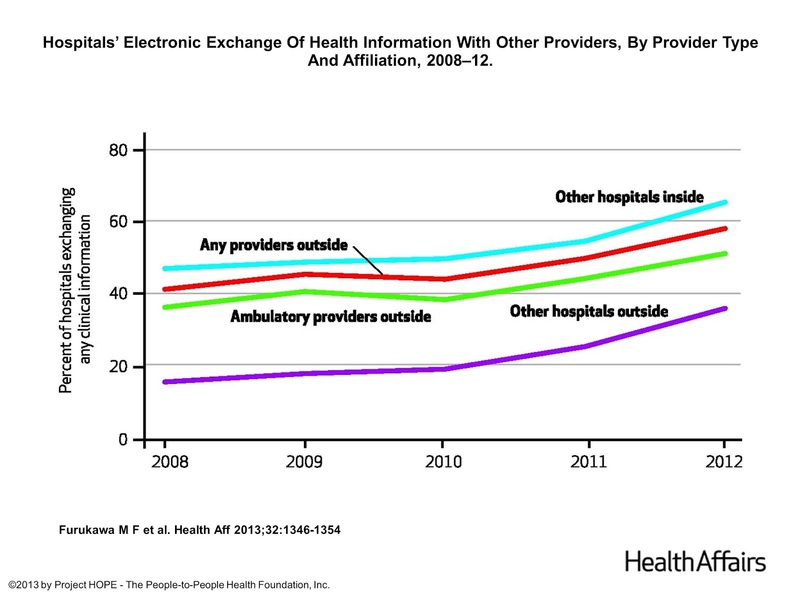 The study shows (see below) that the rates of hospital exchange/sharing of information with any other entity, which stood at 41% in 2008, jumped to 58% by 2012. That’s a whopping 17% over 4 years or slightly over 4% per year on average, although there is a clear acceleration after 2010 when financial incentives became a reality. According to CMS reported numbers, the government paid out roughly $14.5 Billion in incentives to hospitals and health professionals by the end of 2012, or approximately $850 Million for each 1% increase in self-reported electronic exchange/sharing of health information by hospitals. The survey did not inquire about the levels of such exchange, so there is no way to ascertain if hospitals with affirmative responses are exchanging all clinical information of the types listed, most of it, some of it, or occasionally some things here and there. A quick back of the napkin calculation indicates that upwards of $27 Billion will be needed to sustain the current growth rate for the next 8 years or so, in order to achieve universal exchange, and that’s without counting the startup costs of State HIE organizations, Regional Extension Centers and other grant making activities for this purpose, not to mention privately funded infrastructure and operational expenses. And here I have to make a confession: these dollar amounts are in a realm of finance where I cannot tell if these are reasonable expenditures, an incredible bang for the buck, or outrageous waste. It makes perfect sense that making pertinent information electronically available at the point of care is helpful, and test results, clinical summaries and medication lists are obviously pertinent in most cases. But then, it also makes perfect sense that propping a clogged artery open with a stent should be very helpful in most cases. What is not obvious without additional research is whether there are cheaper and less invasive methods to achieve the same results. Does the most cost effective method of making clinical data available at the point of care consist of a nationwide network of big-iron servers and Federal protocols, continuously fed by hundreds of thousands of clinicians furiously typing and clicking away at hostile terminals? Maybe. Maybe not. Unencumbered by any doubts, HHS is proposing to forge ahead with “Principles and Strategy for Accelerating Health Information Exchange (HIE)”, because “real-time interoperable HIE” is critical to the success of the Affordable Care Act and its various programs. Note that HIE just got a couple of extra qualifiers prepended to it. Interoperable exchange implies that the exchange is taking place between machines (not people), and that those machines can both exchange information, and understand it well enough to put it to some use. Interoperability is all about the exchange of computable data elements and their analysis. So having a piece of paper (or a PDF) containing all pertinent information, magically appear in the hands of a hospitalist or other care provider, on-demand, does not qualify as interoperability. It doesn’t qualify as real-time either, because real-time in computer language means just as it happens, with no delays and no waiting, so when the doctor updates something in his computer, the hospital computer knows right away, and vice versa. A recent survey of physicians, conducted by Tilburt and colleagues and published in JAMA, finds that most doctors support measures to improve the quality of care, but are opposed to financial schemes aimed at reducing health care utilization across the board, and physicians do not believe that the responsibility for escalating health care costs lies solely with the medical profession, with 85% opposing the denial of “beneficial but costly services to certain patients because resources should go to other patients that need them more”. While over three quarters of respondents reported being aware of costs of care, and agreed that discouraging use of expensive treatments with limited benefits is a good idea, 78% believe that doctors “should be solely devoted to [their] individual patients’ best interests, even if that is expensive”. The vast majority of the 2556 respondents to the survey place responsibility for escalating costs of care on multiple entities, such as insurers, hospitals, trial lawyers (i.e. malpractice law), patients, government and physicians themselves, with no single mea culpa directed exclusively at doctors. For some reason, this complex view of the health care industry seems to enrage health reform advocates, and none more so than Dr. Ezekiel Emanuel. Dr. Emanuel’s reaction to the survey findings, published in the same JAMA issue, begins by establishing the usual and customary sense of urgency. According to Dr. Emanuel, health care costs are responsible for increases in college tuition, crippling levels of student debt, stagnation of workers’ wages, federal deficits and national debt. Although Dr. Emanuel left out unemployment, over dependency on fossil fuels, Detroit’s bankruptcy and the sub-prime mortgage crisis, all of which could be tied back to costs of health care equally well, he did not miss the opportunity to ascribe “the same reason bankers are averse to many aspects of banking reform and transparency in derivatives and other market matters” to physicians opposing his preferred brand of change. Why would a respected scientist need to resort to this type of rhetoric? Back in September 2012, right before the Presidential elections, Dr. Emanuel and 22 other “leading health-policy experts with diverse perspectives” affixed their names to a grand solution to contain health care costs, published in NEJM and proclaimed to “have the greatest probability of both being implemented and successfully controlling health costs”. Some of those diverse perspectives can be gleaned from the attached disclosures of potential conflicts of interest, or in some cases a surprising lack thereof. The comprehensive solution, which Dr. Emanuel briefly summarizes in his response to the Tilburt survey, includes such staples as transition to large integrated health systems, elimination of fee for service, bundled payments, expanding use of non-physicians and introduction of overt cost considerations into clinical decision making to curtail utilization. The solution had more than the greatest probability of being implemented, since it was already being implemented at the time of the NEJM publication. As to having the greatest probability for successfully controlling costs, it seems that physicians responding to the latest survey partially disagree. When you look at the heart of the survey results (Table 3), it is very difficult to understand Dr. Emanuel’s fury. The majority of doctors is accepting some responsibility for health care costs, and is supportive of “quality” improvements, and somewhat begrudgingly is even onboard with EMRs. Chronic care management, continuity of care, preventive care, evidence-based practice, transparency of performance data, cost-effectiveness research and most other presumed pillars of the Triple Aim garnered wide support from respondents. Although stating that some of the numbers are not as discouraging as others, in Dr. Emanuel’s opinion, “[n]ot unlike the public, physicians embraced reforms that are sufficiently vague that they may offer only modest improvements but certainly will not transform the health care system”. Well, if quality improvements are “vague” and not transformative enough, what is it that we are missing? First, the survey indicates that doctors are not buying into the concerted vilification of fee-for-service payments, and since the drive to eliminate fee-for-service is based on nothing more than hope, belief and wishful thinking, the only rebuttal to disagreement is vilification of the opponent and contending that “physicians are lapsing into the well-known, cautious instinctual approaches humans adopt whenever confronted by uncertainty: blame others and persevere with “business as usual.”” If those who desire to abolish private practice in favor of systems based care, which is what fee-for-service elimination is all about, have any supporting data showing how corporate medicine is having beneficial effects on costs and quality of care, this would be a perfect time to share it. But since there is no such data, and experience in other countries shows that fee-for-service has no inflationary effects on costs, and perhaps even the opposite is true, philosophical statements will have to do. Similarly, physicians oppose the thick web of financial carrots and sticks aimed at reducing utilization in general and inpatient utilization in particular. Considering emerging studies (here and here), it looks like those who actually practice medicine understand that very little utilization is amenable to prevention by physicians. There is now, and always has been, very good data indicating that utilization of services in the U.S. is in most cases lower or comparable to other countries, and the difference in levels of expenditures lies mainly in outrageously inflated unit costs. Unit costs, whether bundled, capitated or calculated as salaries are not under physicians control today, and most certainly are not envisioned to be so, in the reformed corporate system. Disputing the merits of readmission penalties and bundled payments is not the same as “denial of responsibility”. In fact, 85% of survey respondents agree to various degrees that “[t]rying to contain costs is the responsibility of every physician”. Well? Is this not puzzling enough to grant the masses of practicing physicians a fair hearing? Second, it looks like Dr. Emanuel wants physicians to lead, or be the “captains”, of the “all-hands-on-deck” effort to control costs. It’s not enough to provide high quality care and generally be mindful of costs. Something else obviously needs to be done, something that is too uncomfortable to mention perhaps, but should somehow be implicitly understood. A line in the sand has been drawn by the majority of responding doctors who prefer placing individual patients’ best interests ahead of the scarce resources allocation games people dance around these days. Now, Dr. Emanuel has written extensively on allocation strategies for truly scarce resources, such as transplant organs or hypothetical scarcity of vaccines during an epidemic, but on many occasions he made it abundantly clear that these theories do not apply to money as a resource, and that his vision of health care reform does not include this difficult type of rationing. Thus logic would dictate that refusal to engage in denial of care to certain individuals, on behalf of the greater good, should not be the reason for threatening physicians with the doom and gloom of being marginalized into “just another deckhand”. So what is it then? Is there an absolute truth somewhere that escapes all but a chosen few? It is possible that Dr. Emanuel simply failed to articulate specific expectations on how doctors should lead the cost containment effort, so it may be helpful to look at an example of a physician more than willing to take the lead in this field. Dr. Saurabh Jha, a UK educated radiologist, in a perspective piece in NEJM describes his yearning to become an all-powerful imaging gatekeeper, emulating his hero, a certain radiologist called “Dr. No” somewhere in the UK, who used to deny all radiology orders without ever laying eyes on a patient. Eerily in sync with Dr. Emanuel’s musical vision of a transformative “symphony”, Dr. Jha is pondering who should “orchestrate the contrived march to scarcity of imaging and judiciously dispense the scarce resources” as “value is being redefined”. The answer is of course, radiologists, and as Dr. Jha explained in a follow-up interview, this is about increasing relevance (no deckhands here), and preventing commoditization of the profession, because radiologists “can't be as ubiquitous as water and expect to command the price of diamonds”. Unlike the physicians in the Tilburt survey, Dr. Jha seems more than happy to take responsibility for cost management and “contrived” rationing, but expects to be “shielded from liability” for any preventable deaths falling outside his equally contrived thresholds for risk. 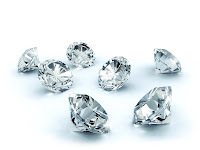 I am not sure who is going to pony up the diamonds, but I would venture a guess that plenty of hard cash will be forthcoming for this grand deception of the American people.